In unhealthy relationships, there is often the person who is causing the problem, and then there is the person who enables that person and feeds the dysfunction. Both are unhealthy, both contribute to the problem. 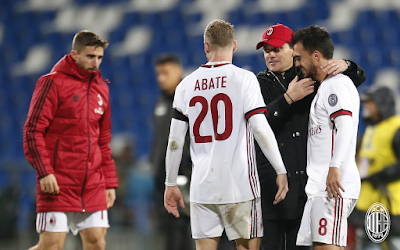 This match highlighted that, because Montella, again going with the 3-5-2 and his mismatched “clothing,” had his dysfunction covered by the team and their win. 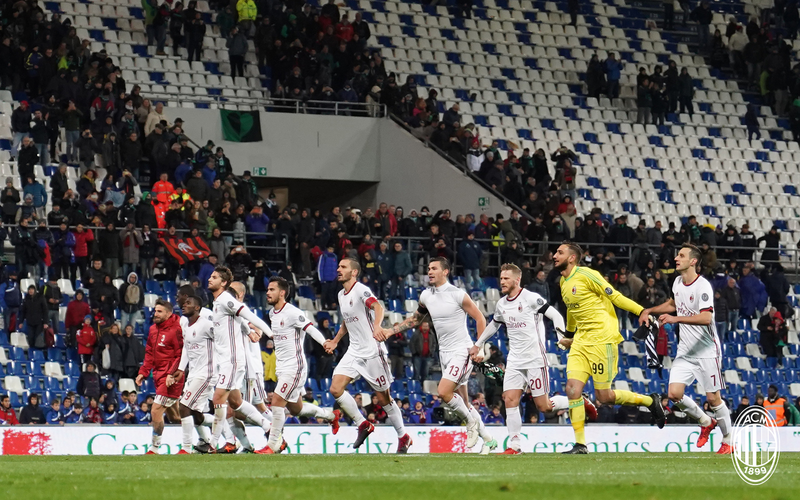 Like the best of enablers, their performance not only produced three much needed points, but also contributed to saving Montella. The performance was improved, although it was also 17th place Sassuolo, and they didn’t put up as much of a fight as other teams might have. Wait, let me rephrase that: they put up a fight, the game was very physical. They just didn’t play that well. In fact, their performance may have sent Bucchi to the unemployment lines, while ironically, Montella was spared to coach another match. The ninth minute saw Calabria get injured. Which was such a shame because he was just coming back from his head injury. After trying out the injured ankle, he had to be subbed off just five minutes later. Two minutes after that, Borini elbowed Ragusa in the face. Which is of note, because Bonucci did the same thing two weeks ago. But since his victim bled and the opposition players begged the ref to review it, VAR was invoked and Bonucci got sent off and was given a two match suspension for violent conduct. That is the “beauty” of VAR. Speaking of Bonucci, he harassed Damato a lot about a call in the 24th, he was lucky not to be cautioned then, particularly since he did see yellow in the 55th. But where I came in the first time through was when Borini injured himself attempting a bicycle kick in the 27th. To have two wingers (and I do use that term lightly here) injured in the first 30 minutes could have been devastating. But luckily, he was able to continue. Can’t have two actual wingers on the pitch now, can we Montella? The 39th saw Kalinic come knocking, and then in the same minute, Romagnoli score from a Calhanoglu corner. 1-0 Milan. And that goal not only put us ahead, but upped our game, as the intensity and performance improved from there. Like Bonucci’s monster save in the 45th + 2, which apparently was enough on its own to turn his haters into fans again, so even better. Speaking of monsters, Kessie had a monster game. I lost count, but he may have had more attempts on goal than either of our strikers. Of course, Suso’s great attempt in the 67th sealed the deal for Milan, 2-0. So ironic that Suso has been stifled so much this season in Montella’s 3-5-2. Then in the game that was rumored to be Montella’s last if we lost, Suso scored to ensure Montella stays. Talk about dysfunction. Certainly, it was a better performance, especially by a few individuals. 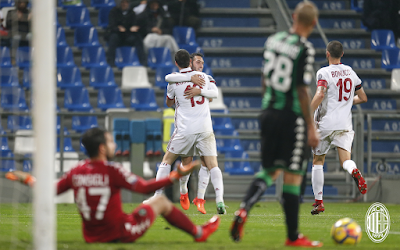 But we didn’t find much resistance, Sassuolo had only one shot on target out of only six attempts in all. And certainly, we found our clinical abilities again: Milan had ten shots on target out of 14, so that is what made the difference from our other performances of late. But the big disappointment was that Montella will live to coach another tactically bereft day. Which means we, as fans, will have to continue watching those mismatched socks and trousers squander our Champions League hopes away. Sure, it’s amazing to have taken three points. But disappointing that in doing so, the team are saving Montella.